Company’s recreational days for 8 persons starting 45 €/person/day including accommodation and an approx. 2-hour guided tour in the nearby nature. In November 2018, a construction of new 130 square meters multifunctional villa will begin in Aulanko Lake Corner area. In spring 2019 it will be combined with Lake Corner’s current buildings. This will create a magnificent new Aulanko Lakeside complex of up to 25 beds in four buildings and two lakeside saunas. The new building is externally ready for Christmas 2018 and customer service during the early spring. During construction work, other buildings in Lake Corner area are normally available for our guests. Aulanko Lake Corner is a multifunctional and calm destination in Hämeenlinna built for year-round use and groups up to 7 persons. The buildings are only 25 meters from the lake and have been renovated and equipped with modern comforts in summer 2017. Aulanko Lake Corner is great for parties, vacations, small meetings and also for short term employees who require temporary accommodation for longer periods. The destination is made of 2 buildings each 25 meters apart. 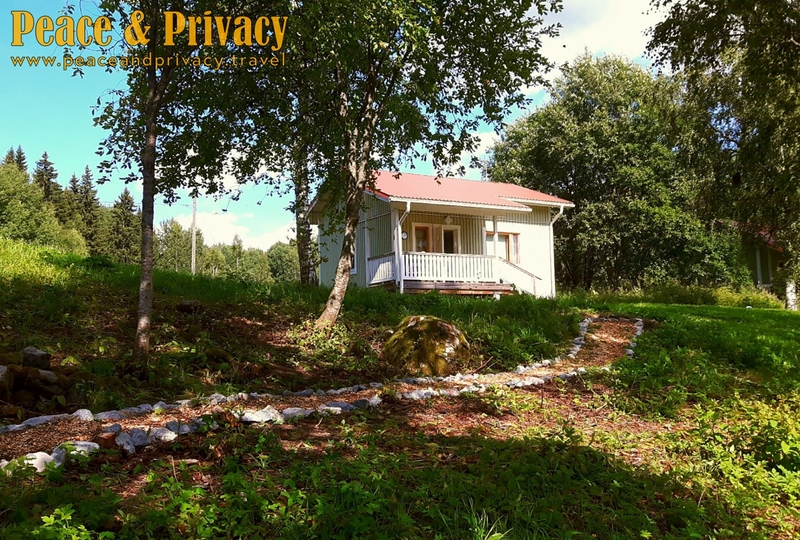 Go fishing, golfing, boating, swimming, ice fishing, snowshoeing, cross-country skiing, have meetings, go to the Aulanko Spa or just enjoy your time at your own pace any time of the year with Peace & Privacy. Aulanko Lake Corner also works great as a base for exploring Aulanko Nature Reserve or taking a relaxing trip to the Aulanko Spa. Hämeenlinna city centre is only 6 kilometres or 15 minutes away by car giving the possibility to have a city vacation also! The main building’s main room has a 2,5-meter-long table that sits 8 persons comfortably for dining, meetings or just casual socializing. 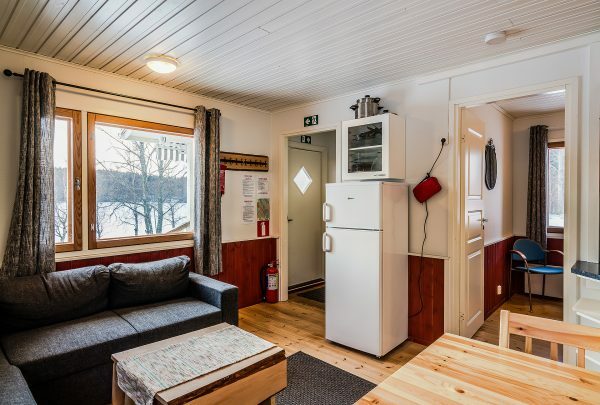 The kitchen has tableware for 10 persons, a fridge freezer, a stove, an oven, a microwave, a dishwasher, a Moccamaster, an electric kettle and a toaster. The main room has also a convertible couch that has 2 bed places. A 50” flat screen is available and can be used as a TV or a presentation screen. The bedroom has bed places for 3 persons. 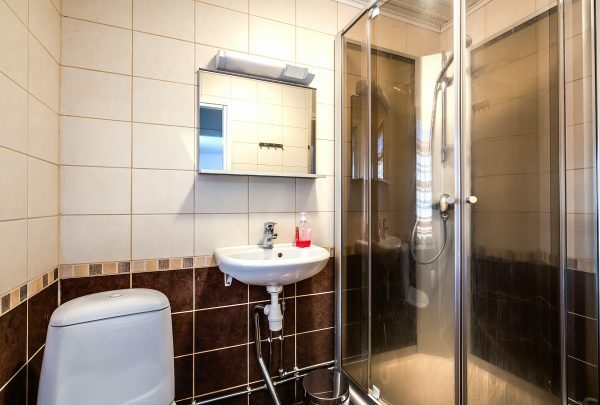 The bathroom with a shower is located next to the entry. 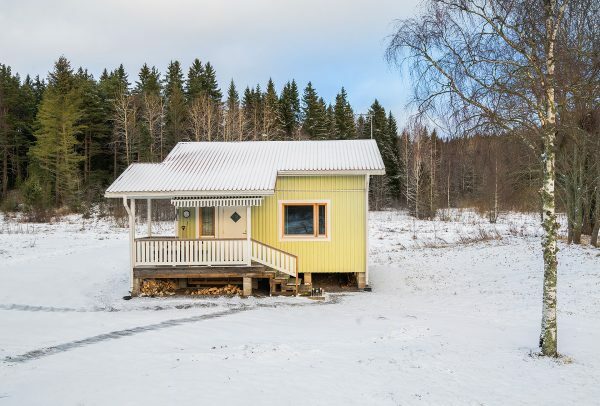 The main building has direct access to 2 terraces that present a gorgeous view over lake Aulangonjärvi and all the way as far as the Aulanko Observation Tower. 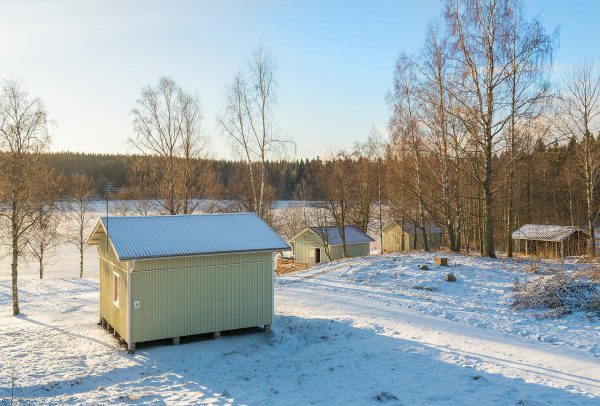 The separate sauna building is located 20 meters from the lake. 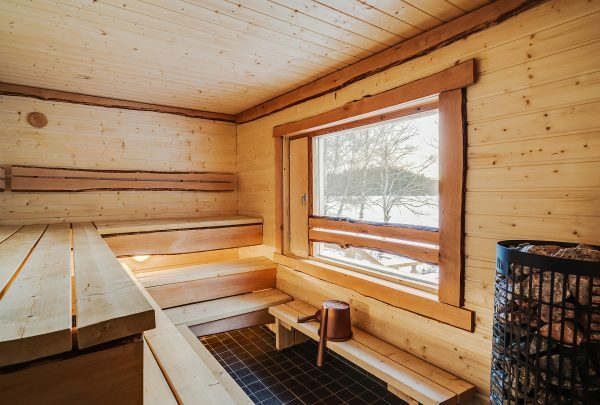 The spacious sauna sits comfortably 8 persons and has effortless access to the lake via the terrace during both summer and wintertime. 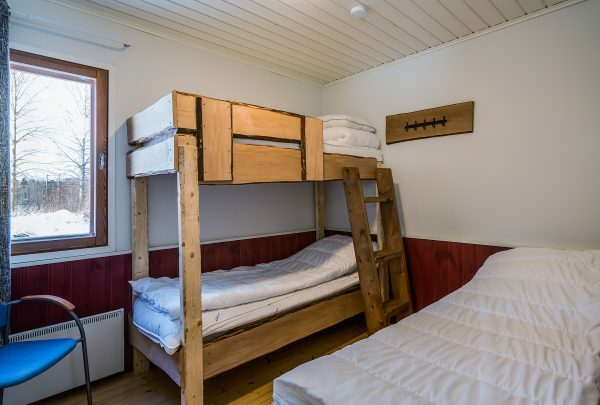 The building has showers, a bathroom, a dressing room with space for 8 persons for cooling-off and socializing, and a small bedroom for 3 persons. Also, the terrace has a large 6-8-person hot tub to soak in about while admiring the view! Accommodation: All together there are 7 bed places in 2 separate buildings. 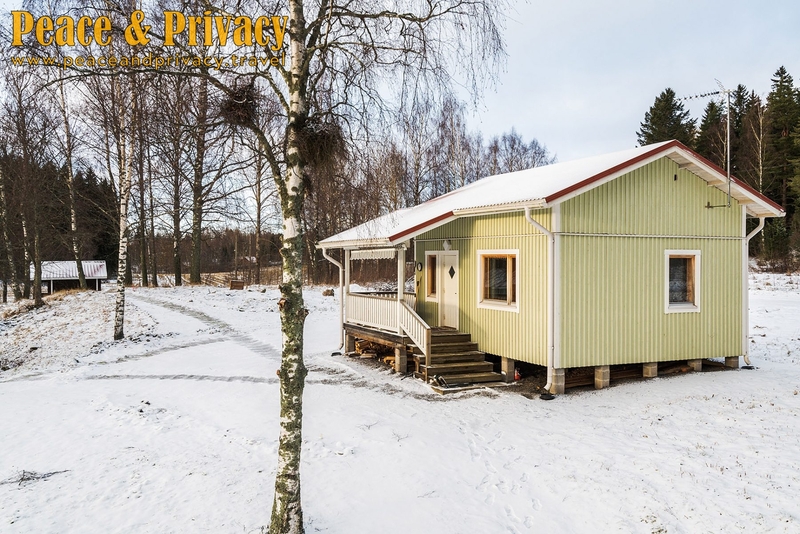 The main building has 3 bed places and a convertible couch for 2 persons and the sauna building’s bedroom has 2 bed places. 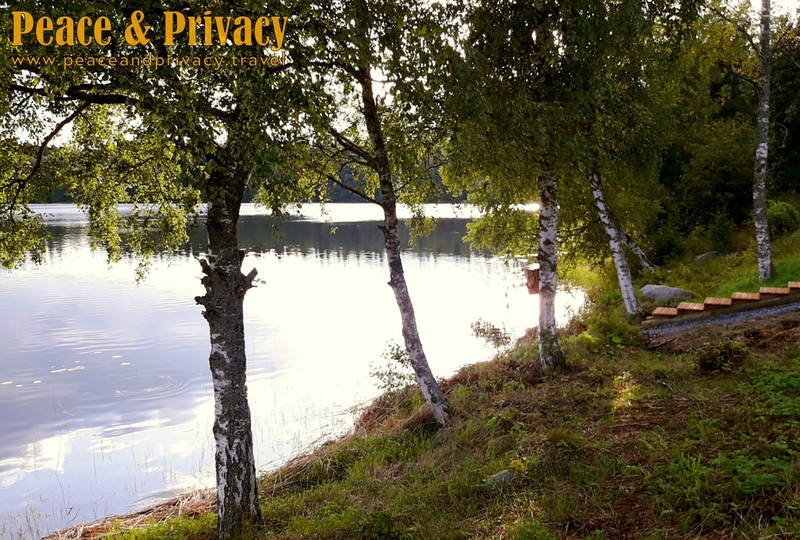 Fishing, Boating and Paddling: Aulanko Lake Corner is located 20 meters from the shoreline which makes going fishing, boating and paddling on the peaceful lake effortless. 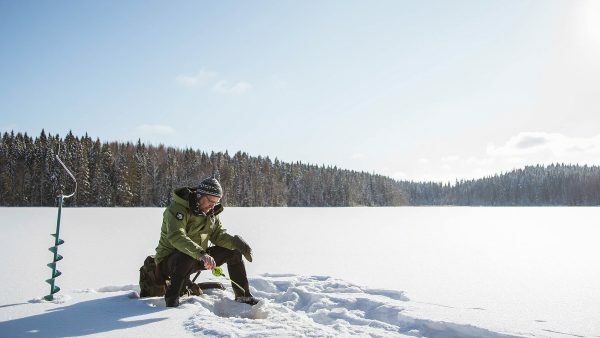 In the winter the lake is great for ice fishing, cross-country skiing and ice skating. We will gladly organize guidance in fishing, so please ask if you are interested. The price includes the multifunctional entirety of the 3 buildings. Additional services offer the use of the hot tub, the final clean-up, towels and sheets with the bed made or sheets as a stack. 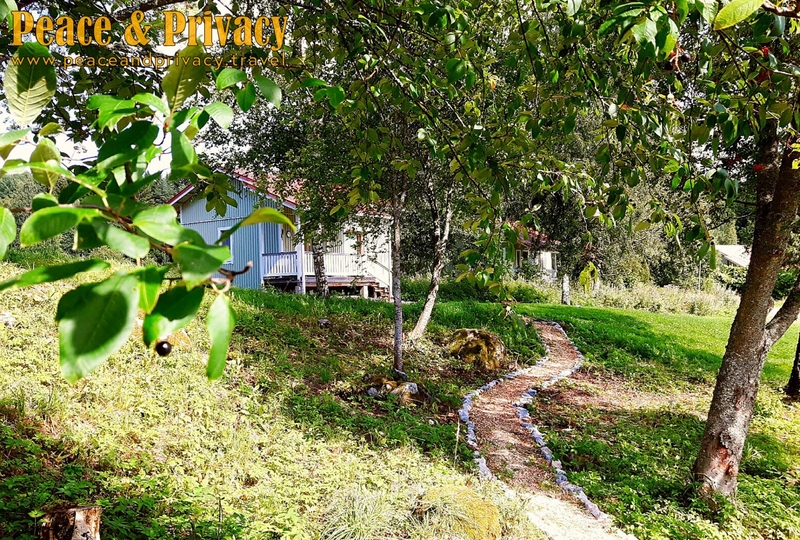 Ask for an offer for Aulanko Lake Corner by filling the offer request or by contacting us via email info@peaceandprivacy.fi.